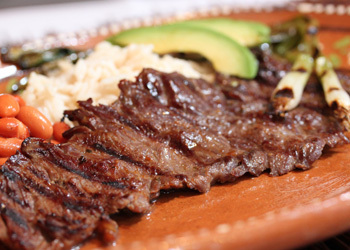 Having just celebrated Blessing of the Animals on Olvera Street and looking forward to the Cinco de Mayo festivities, May is the ideal time to enjoy a Carne Asada dish. This grilled marinated steak recipe can be a main meal or a taco or burrito lunch. Pour orange juice, garlic, oregano, Comino, pepper corns, and oil in a glass bowl and whisk until mixed. Place meat in 13 inch glass casserole dish and pour mixture over meat making sure that the meat is covered on all sides. Refrigerate two hours. May also be prepared and left to marinate overnight. Prepare the grill. Season meat with salt and pepper. When charcoal is white hot, place steaks on grill. Cook about 5 minutes on each side. Grill rare, medium or well done to taste. When meat is almost ready, grill green onions and raw jalapeño chilies for garnish. As a main dish serve with Mexican rice, refried beans and salad. Corn or flour tortillas, spicy salsa and guacamole complete the dish. Las Anitas serves Carne Asada entrees, burritos and tacos year round.